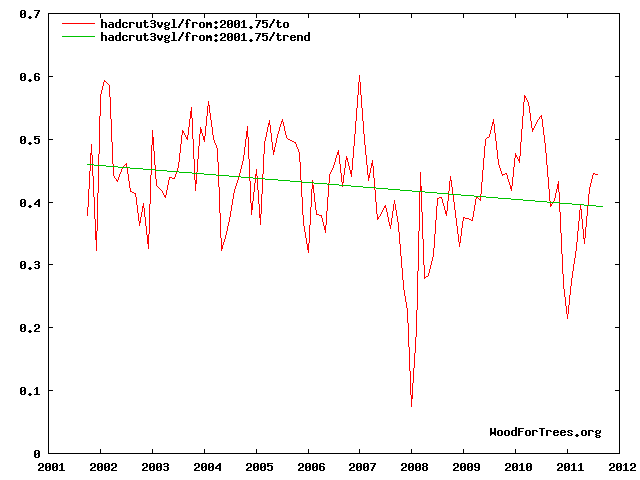 ← BEST Proves that the Earth is Warming! Well, the BEST results are in. And to hear some, this is the death knell to the skepticism of the CAGW hypothesis. 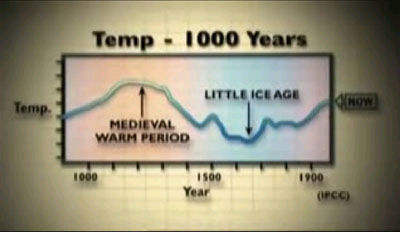 Supposedly, this is proof that the earth has warmed and that skeptics had stated that the earth hadn’t warmed. Another common statement is that the BEST project was even headed by a ……. skeptic. Anyone who has bothered to look would know Richard Muller has been a CAGW advocate for quite some time. In fact, Muller has a business that profits from the alarmism. Just because Muller was critical of some of the more inane absurdities posited by other alarmists doesn’t mean he’s a skeptic. (My thanks to Legatus for his comment on WUWT.) If that were the case, then Jim Hansen would be considered a skeptic, as documented on this blog. 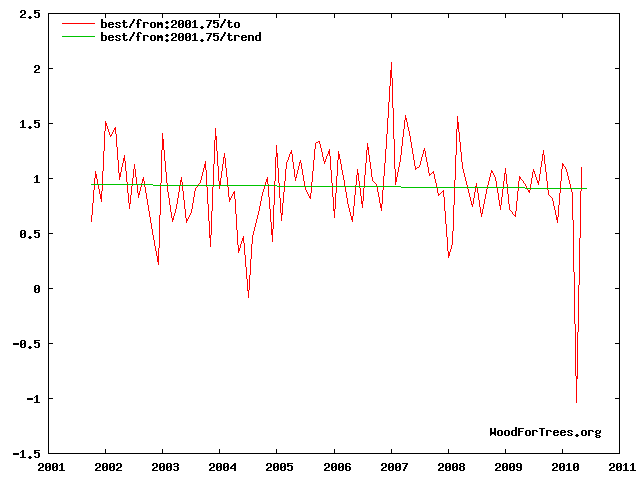 we can say the earth isn’t warming. 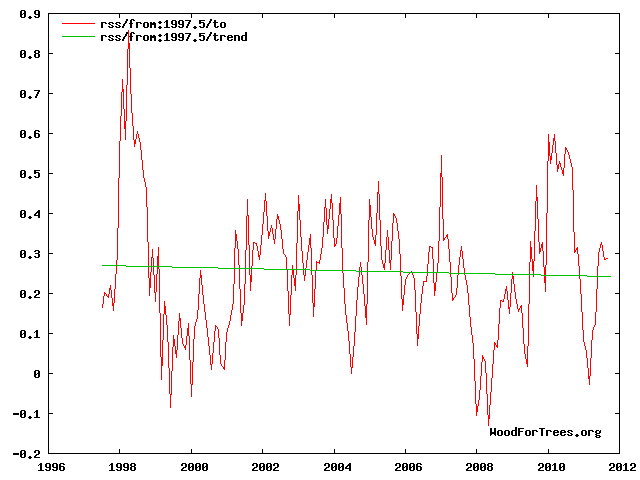 Or, when we reference the MWP…..
or even for over 14 years, the RSS temp plot…. OR EVEN GIS TEMPS FOR THE LAST DECADE!!!! We can say the earth hasn’t warmed. In fact, only one data set shows warming in this decade, UAH; a data set run by two very real skeptics, Drs Christy and Spencer. 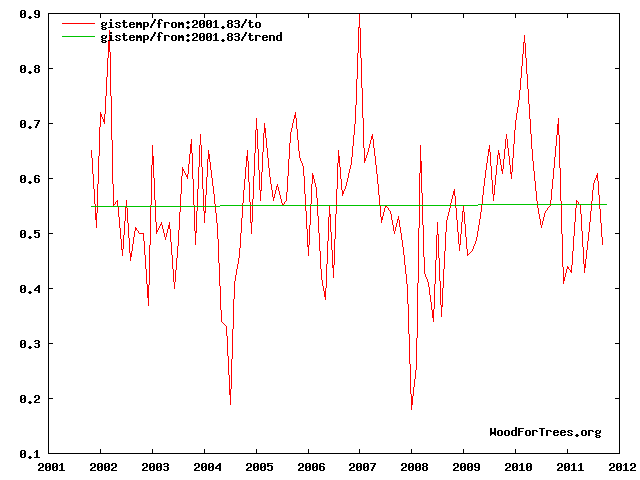 And as you can see, the reported warming is negligible. La Nina should soon bring UAH more in line with the rest of the data sets. So, when some pinhead/writer blathers something about Dr. Muller this or BEST that, or skeptics said this or skeptics said that, tell them to get a life, get real, come with the proof, or go home. The earth warmed, slightly, during the last century. IT WAS SUPPOSE TO! And, I hope it continues, but I don’t think it will. Which reminds me of something that will not even make sense to a warmista….. They are claiming everything from soot to sea temps right now…. Why does every CO2 graph show that regular, steady incline? 🙂 I’m glad you reminded me of that…… I’ve been meaning to compare the unique locations of the ice core CO2 derivations to Beck’s measurements and then to that new cool app that supposedly shows our CO2 levels, and how all of the inferences are…… questionable. well….how can you measure 440 in 1820 and just make it disappear? 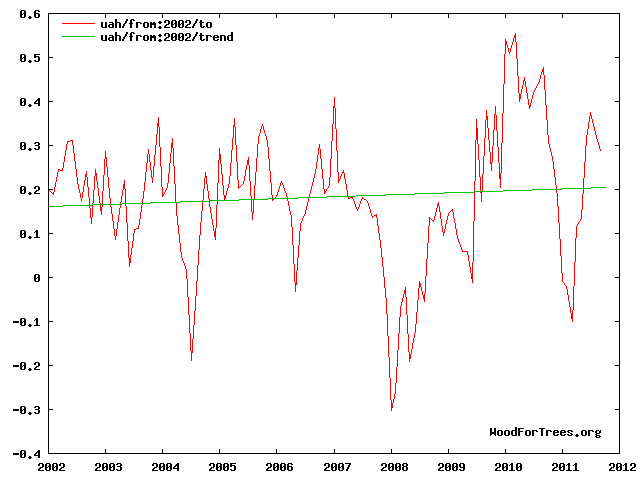 We know sea temps have gone way up and down….yet that doesn’t show in the CO2 measurements either. 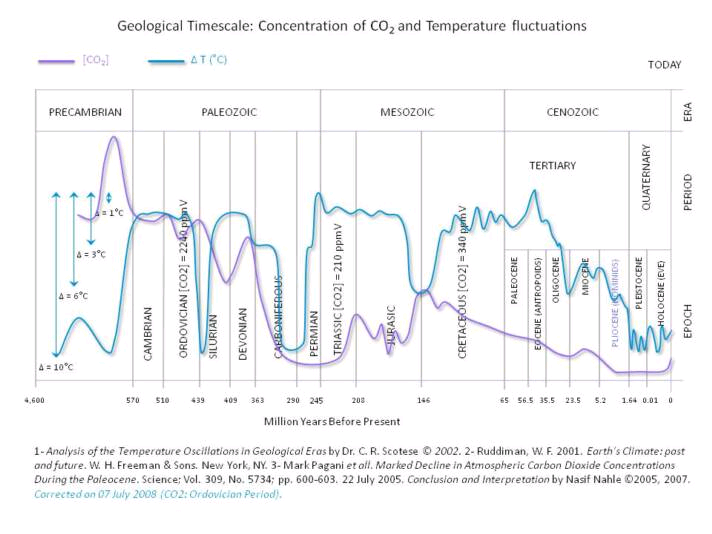 What’s funny about the geological chart – first one – is separate the CO2 line and the temp line, move them up and down on each other…….gives you a whole new perception of it. Yeh, I know other skeptics will whine about it, but ice core data is just data in a specific place…… sort of..(Ice moves). And a specific time…..sort of…..(they don’t have any idea of when that CO2 came to be, just when it came to be frozen)……sort of……. Yep, wild swings of 100+ ppm in short time could never have happened in yonder time. BTW isn’t it odd that winters are coming sooner, getting colder, snowing sooner, while temps are supposed to still be going up…. These nut jobs really think it doesn’t get chaotic when it’s in a transitional phase….. But, I thank you. I thought it needed stated. Some lesser experienced skeptics don’t know how to reply to mischaracterizations such as what the LSM and alarmists are trying to do with this BEST/Muller BS. Both of you are doing a good job of keeping it stirred up. Beck proved that CO2 is not a well mixed gas and his records had to be discredited to support the fallacy that is the so called global CO2 record started by Revelle and company. The minor differences shown in the satellite records that claim to be measuring global CO2 by regions actually discredits those records. Living in a deciduous forest I can see the vast swing in CO2 concentrations just watching the biologic activity around me. Smoothing destroys the signal and they admit throwing out the “Outliers” in the data. Yes regions on the globe have experienced variable weather patterns for the entire history of the globe and still are. I an sceptical about any claimed short term trends as they appear to be artifacts of the methods used to measure and record them. Regarding Muller, Pathological science at its BEST! I can picture the coconut shells being used as head phones on those people so they can attract the cargo planes. They probably also lit off a parallel row of fires to represent a landing field hoping to attract their money plane. Hahaha…Coconut shell head phones…nice! The Warming Models serving up koolade. The money people are so into funding fairy tales they threw money at this PlayStation construct. Hey I really enjoy your articles. I linked to your blog on my website about the PSP3000 so my website visitors will visit your blog hopefully. You are my breathing in, I own few blogs and rarely run out from brand :). “Follow your inclinations with due regard to the policeman round the corner.” by W. Somerset Maugham.